^ Census 2011 - County Clare Overview. ^ Clare, The Banner County - World Cultures European. Irishcultureandcustoms.com. [2012-04-19]. ^ NB: not related to the Slieve Bearnagh mountain in County Down. ^ Climate. Clare-Tour.com. 25 December 2008. Anthon, Charles. A Classical Dictionary. Harvard University. 1855. 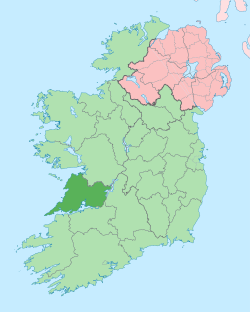 O'Laughlin, Michael C. The Families of County Clare, Ireland. Irish Roots Cafe. 2000. ISBN 0-940134-98-5. The Four Masters. "The Annals of Ireland by the Four Masters" as translated by Owen Connellan. Irish Roots Cafe. 2003. ISBN 0-940134-14-4.